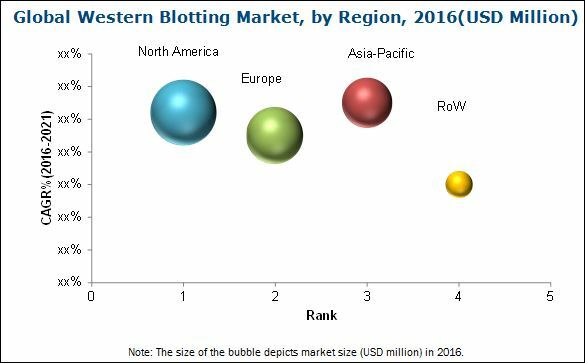 [169 Pages Report] The western blotting market is projected to reach USD 730.7 Million by 2021 from USD 574.8 Million in 2016, at a CAGR of 4.9% in the next five years (2016 to 2021). The growth of the overall market can be attributed to the increasing number of research activities and R&D spending by pharmaceutical and biotechnology companies, rising prevalence of HIV/AIDS, and growing proteomics market are key factors driving the demand for western blotting instruments and consumables, increasing demand for personalized medicine, and new product launches are some of the other factors driving the growth of this market. The report segments market based on product, application, end user, and region. The western blotting market, by product is segmented into instruments and consumables. Consumables segment is expected to account for the largest share of the market, by product in 2016. This segment is also expected to grow at the highest CAGR during the forecast period. The western blotting instruments are further classified into gel electrophoresis instruments, blotting systems, and imagers. The blotting systems segment is expected to account for the largest share of western blotting instruments market, by type in 2016. However, the imagers segment is expected to grow at the highest CAGR during the forecast period (2016-2021). Based on the end user, the western blotting market is segmented into academic & research institutes, diagnostic centers, pharmaceutical & research laboratories, diagnostic centers, forensic laboratories, and contract research organizations (CROs), among others. In 2016, the academic & research institutes segment is expected to command the largest share of the global market, by end user. However, the pharmaceutical & biotechnology companies segment is projected to grow at the highest CAGR from 2016 to 2021.